We've all seen or taken part in some seemingly awkward family photos. Why not play a game about it. This hilarious game showcases some really funny awkward family photos. Match famous movie lines up with the best photo to win over the judge and get your points. 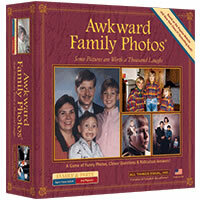 Awkward Family Photos is a great party game for four or more players and won't take a long time to play. You'll have a great time matching funny lines with funny pictures. Give the game Awkward Family Photos a try today. The first player to win the correct number of rounds wins. You get 330 movie line cards, one box of 80 large double-sided cards featuring 160 awkward family photos and the official Awkward Family Photos game rules and instructions. Please keep in mind that the official Awkward Family Photos party rules and instructions could be different depending on the game version you have. The rules below are some of the exact directions on how to play Awkward Family Photos. Share with us your comments, funny stories, tips, advice, strategies, creative ways to play, questions about how to play, problems with the rules or anything you want about Awkward Family Photos. All submissions will be reviewed within 24 hours. Click here to add your Awkward Family Photos comments.